Is your church prepared to minister to those God desires to bring each week? Does your church have a system of assimilating guests and new members into the church body? Are You Connecting with Guests? The heart of God is actively drawing people to Himself. In an effort to bring the lost into a saving relationship with Him, God often will draw that person to His church, the stewards of the mysteries of grace, where they might work in cooperation with God. Dr. Tim Madding looks at the subject of biblical hospitality and how as a church, we can best prepare for and minister to our family, friends and neighbors that God brings to us. ◊ Five videos sessions for small group, church leadership development, or individual use. 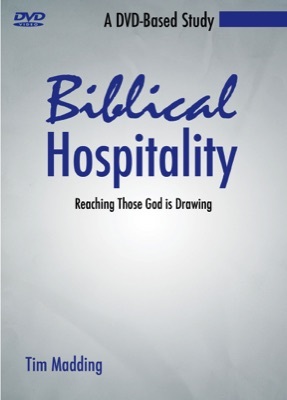 ◊ A copy of Biblical Hospitality Participant's Guide. ◊ A digital copy of Biblical Hospitality Participant's Guide for duplication. ◊ A copy of Dr. Tim Madding dissertation, Implementation of a Guest Retention Process in the Louisville First Seventh-day Adventist Church for Maximal Evangelism Effectiveness. ◊ Resources to help you begin implementing a process of Biblical hospitality in your local church. ◊ Applicable for any church at any size, including multi-church districts. ◊ The purchase price for the kit is $49.99. Click “Add to Cart” button below to get started!